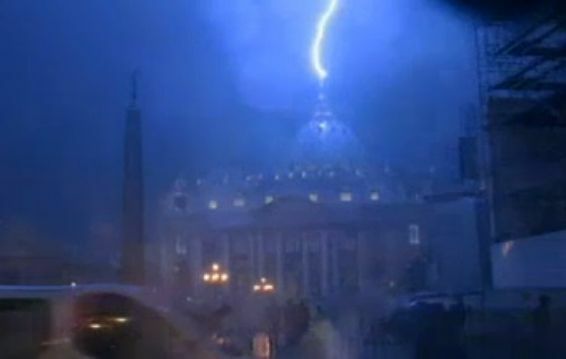 Just after the Pope announced his resignation, Saint Peters at the Vatican was struck by lightening a few minutes past 6PM. This is now being herald as proof that the last Pope will arrive according to St Malachy’s forecasts. I remember when there was the assassination attempt on the last Pope. The markets went dead silent. Nobody knew what to do. Was it bullish or bearish even for gold, the dollar or stocks. There was no precedent. Everyone sat around dumbfounded. So sorry – I have no opinion on acts of God. All I can confirm is the Cycles of War based on a data index back to 6000BC, turns up in 2014. I have no opinion on religion. That is a personal belief for everyone and I am a firm believer in Freedom of Religion that is an essential cornerstone of LIBERTY. So I will always defend the right to believe like the right to speak even if I disagree for to deny that to anyone means when the cycles change it will be denied to me. « The Dow 20,000 or Bust?